Link to explainer video here. Brazil made meaningful progress in tackling poverty over the past decade, largely as a result of public investments in health, education and social protection. Not coincidentally, the country’s economy thrived from burgeoning domestic demand. Brazil set an example in its initial response to the 2008-2009 global economic crisis by increasing social investments, which in turn sustained the economy while protecting human rights. Yet, as this factsheet researched by CESR, INESC, and Oxfam Brasil illustrates, these advances are at imminent risk from a series of harmful and severe austerity measures put in place by the government starting in 2015. While aimed at tackling spiking deficits, these initiatives are deepening socioeconomic inequalities in Brazilian society, with particularly disproportionate impacts on those already disadvantaged. Among the most extreme of these measures, the Constitutional Amendment 95/2016 (EC 95), known as the “Expenditure Ceiling Act", is particularly far-reaching in its harm to human rights. Coming into force in 2017, this act took the unprecedented step of freezing real public spending for 20 years. By constitutionalizing austerity in this way, any future elected governments without an absolute majority will be prevented from democratically determining the size of human rights investments needed to deal with aging populations and increased financing needs. The UN Special Rapporteur on Extreme Poverty and Human Rights considered the EC 95 “a radical measure, lacking in all nuance and compassion", arguing that the amendment “has all the characteristics of a deliberately retrogressive measure." This call reinforced an earlier statement by the Inter-American Commission on Human Rights that the government’s turn to harsh austerity measures may well be in violation of its legal obligations. Under international law, states’ margin of discretion in responding to economic crises is not absolute. To be in compliance with human rights standards, fiscal consolidation measures must: be temporary, strictly necessary and proportionate; non-discriminatory; take into account all possible alternatives, including tax measures; protect the minimum core content of human rights; and be adopted after the most careful consideration with genuine participation of affected groups and individuals in decision-making processes. On the first anniversary of Brazil’s "New Fiscal Regime," this factsheet assesses whether the Expenditure Ceiling Act—and the austerity measures surrounding it— comply with these aforementioned criteria established under international human rights law. EC 95 has already begun to disproportionately affect disadvantaged groups, such as Afro-Brazilian women and people living in poverty. Since its approval, new findings presented here show that significant resources have been diverted from the most important social programs towards debt service payments, threatening to exacerbate the extreme levels of economic inequality. This factsheet demonstrates how these fiscal decisions put at risk the basic social and economic rights of millions of Brazilians, including the rights to food, health and education, while exacerbating gender, racial and economic inequalities. Meanwhile, the Brazilian government has not demonstrated that EC 95 was necessary, proportionate and a last-resort measure, nor that less restrictive alternative measures have been explored and analyzed. In fact, there is solid evidence showing that alternatives—such as more progressive taxation and tackling tax abuses—are readily available. Further, these fiscal consolidation measures have not benefitted from public participation, as the measures were pushed through in the midst of narrowing opportunities for public scrutiny, accountability and access to information. The EC 95 is also hardly temporary, but will extend far into future economic recoveries that may occur over the next two decades. These pro-cyclical fiscal measures even run counter to the government’s own aims of deficit reduction. 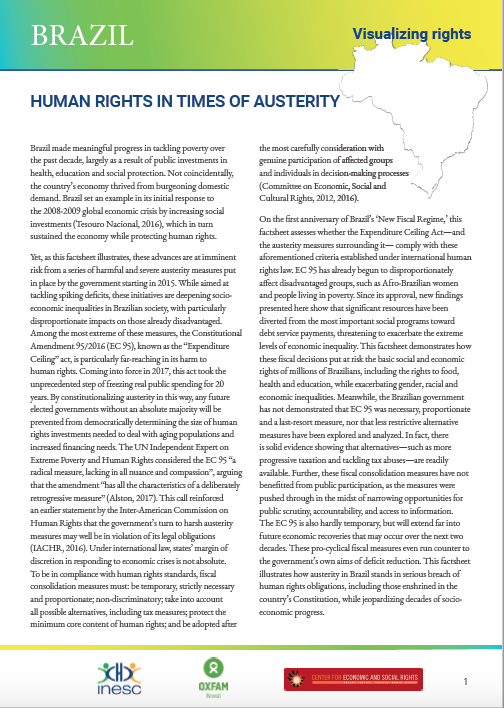 This factsheet illustrates how austerity in Brazil stands in serious breach of human rights obligations, including those enshrined in the country’s Constitution, while jeopardizing decades of socioeconomic progress.